So Barnabas and Saul were sent out by the Holy Spirit. They went down to the seaport of Seleucia and then sailed for the island of Cyprus. This scene is set in the day time, but not at any specific time. There is simple one source lighting (from the sun) from above. 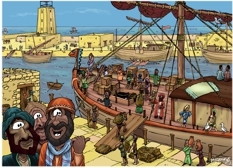 In the left foreground, from left to right are Saul/Paul, John Mark behind them & Barnabas, his uncle, in orange. Verse 5 tells us that John Mark went with Saul/Paul & Barnabas, as their assistant. 3) to dedicate something to God (Leviticus 1:4). By laying hands on Saul/Paul & Barnabas the church at Antioch was identifying itself with them & with their mission. No doubt they asked for the Holy Spirit’s help, wisdom & guidance for these 2 men as well. Seleucia was the seaport of the city of Antioch in Syria (now in modern day Turkey). Note: there were many towns or cities called Antioch, so “Antioch in Syria” is the term used to describe this particular one. Seleucia is approximately 302 miles ( 486 km) almost due North of Jerusalem. Seleucia is approximately 237 miles ( 381 km) almost due North of Nazareth. Seleucia is approximately 180 miles ( 290 km) almost due North of Damascus, in Syria. Seleucia is approximately 80 miles ( 129 km) South East of Tarsus, Paul’s home town. Seleucia is approximately 80 miles ( 129 km) South West of the tip of Cyprus, where Paul & Barnabas were heading. Paul & Barnabas were in “Antioch in Syria” when they got the call to set out on their first missionary journey. The seaport of Seleucia was about 16 miles (26 km) west of the city. Bearing this description in mind, you will see that Saul/Paul, Barnabas & John Mark are looking at a ship moored in the inner harbour. On the far side of the inner harbour you can see some other ships & boats. The tall building to the left is a lighthouse, which would have marked the entrance to the inner harbour. Beyond that you can see several ships sailing to & from the outer harbour, on the open sea.